At a state-wide writer’s contest, I walk across the stage as a finalist in the poetry contest. As results are read, my stomach drops and my face falls. My poem is not the winning choice. I am disappointed. I am weary. My body feels a tremor in response to the fatigue of trying again. Yet, I know, it is not a fail. But my body doesn’t seem to agree. It is never a failure to try. Especially for something vulnerable like putting your art into the world. It is an act of bravery. In that moment, I didn’t feel brave or empowered because of my vulnerability. As in most hard moments, I found myself scribbling something on a scrap piece of paper, to ground myself. A poem birthed in defiance of losing. A few days later, I remember my friend, Jason Neff, is making t-shirts and selling them on Amazon. I want these words on a t-shirt. Jason kindly agrees to design a shirt. I love how it turns out. It’s another act of putting my art into the world. I wore one of the t-shirts to our local hardware store. A woman remarked, “Wow. That is quite a pep-talk.” I smiled and owned up to writing it. It’s more than a pep-talk. It is not about winning, but being true to the fire the breathes within you, the roar that escapes your throat, and fight that echoes after you are long gone. 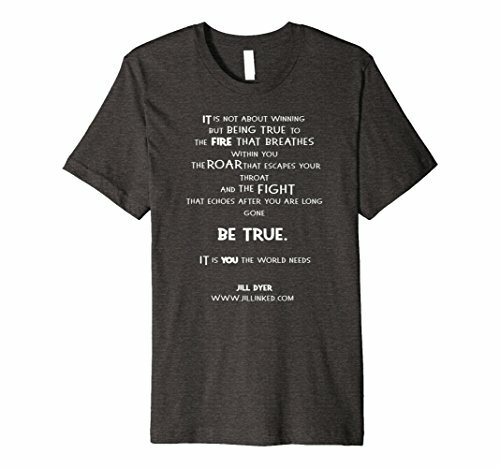 Be true, it it you the world needs.